Paper currency notes began to be issued during the British Rule in India after passing of the Paper Currency Act of 1861. British Government of India entered into agreements with “Three Presidency Banks” - The Bank of Bengal, The Bank of Bombay and Bank of Madras as authorized agents to promote circulations of the paper notes. Due to problems in redemption of these notes, these agreements were terminated in 1867 and the tasks relating to paper notes were handed over to Mint Masters, Accountant General of India and the Controller of Currency. With the enactment of the Reserve Bank of India (RBI) Act, 1934 on 6th March, 1934 effective from 1st April, 1935, under Section 22 of RBI Act, RBI was conferred the sole right of issue and management of currency notes not exceeding INR Ten Thousand denomination currency notes, except one rupee notes which are issued by the Union Ministry of Finance, but are circulated through RBI. Name of Currency: Indian currency is called the Indian Rupee (INR) and the coins are called paise. One Rupee consists of 100 paise. Currently, RBI has a total number of 20 offices across India performing various functions including the managing of currency. In addition to that there are currently 4422 Currency Chests and 3784 Small Coin Depots authorized by RBI for handling currency and coins. The distribution of coins is undertaken by RBI as an agent of the Government of India (GOI). Coins are minted by GOI and not by RBI. Proportional Reserve System was initially followed under which RBI was to hold 2/5th (40%) of the value of the total currency issued in Gold and foreign exchange reserves with minimum gold reserves of INR 40 Crores. In 1956, this system was scrapped and Minimum Reserve System was introduced under which RBI is required to maintain a minimum of Gold and Foreign Exchange Reserves of INR 200 Crore – with minimum gold reserves valuing INR 115 Crore. Bharatiya Reserve Bank Note Mudran Private Limited (BRBNMPL) was established by RBI as its wholly owned subsidiary on 3rd February 1995 with a view to augmenting the production of bank notes. BRBNMPL manages 2 Presses one at Mysore in Karnataka and the other at Salboni in West Bengal. Earlier this task was supervised by Ministry of Finance, GOI. Security Printing and Minting Corporation of India Limited (SPMCIL) – a wholly owned company of GOI established on 13.01.2006. SPMCIL currently has nine units including four mints for minting coins, four presses for printing of currency notes and one paper mill. Currency paper is composed of cotton and cotton rag. The amount of a Currency Note is written on it in 17 languages (Two on the front side and 15 on the backside) of the 22 official languages of India mentioned in the VIII Schedule of Indian Constitution. Sindhi, Manipuri, Bodo, Dogri, Maithili and Santhali are not present on the currency notes. So this makes 16 languages from the Eighth Schedule and English, the 17 languages present on the Indian currency. One Rupee Note and One Rupee coins are legal tenders for unlimited amounts of currency notes issued by RBI – which are Promissory Notes – a promise made by the RBI Governor. 50 Paisa coins are legal tender for any sum not exceeding INR 10. Earlier issued coins in the denominations of 1 paisa, 2 paise, 3 paise, 5 paise, 10 paise, 20 paise and 25 paise were banned since June 30, 2011. All the notes issued by RBI are legal tender and are guaranteed by the Central Government. 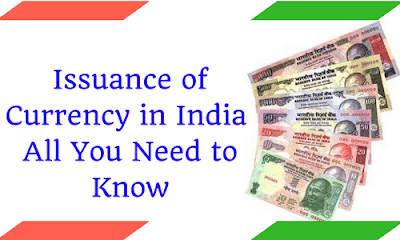 Coins of INR1, INR2, INR5, and INR10 are currently being issued and are named “Rupee Coins”. Quantum of notes to be printed is decided by RBI whereas GOI decides the quantity of coins to be minted. GOI has also been importing rupee coins. Till date 2 billion one-rupee coins have been imported. Rupee Coins of the denominations of INR 50, INR 75 and 1,000 have been issued by RBI as commemorative coins from time to time but these are not legal tenders. The first Indian commemorative coin was issued in 1964 to mourn the death of Jawaharlal Nehru, the first Prime Minister of India. RBI manages seasonal variations in currency circulation. In the busy season, when there is increased demand, the currency flow is expanded, whereas in the slack season, this process is reversed and the currency flow is contracted. At present, notes in India are issued in the denomination of INR 5 – (Previously discontinued in 2000 and again reintroduced in 2001); INR 10, INR 20, INR 50, INR 100, INR500 and INR2000. Printing of one-rupee notes and two-rupee notes was discontinued in 1995 but one-rupee note is now being reintroduced in 2017 but there is no plan to reissue two-rupee note. Rs 500 and Rs 1,000 banned on November 8, 2016 accounted for about 86 percent of the entire currency in circulation. Demonetized notes amounted to INR 15.44 Lakh Crores. This was the third demonetization in the history of issuance of currency in India. First demonetization was done by British Government on 12th January, 1946 after World War II of the highest denomination currency note of INR10, 000 that was issued for the very first time by RBI in 1938. Second demonetization was done by Shri Morarji Desai on 16th January, 1978 again of INR 10,000 denomination notes in that were reissued by RBI in 1954.